New Liturgical Movement: Reports of the Death of the Virgin Mary...Are True! Reports of the Death of the Virgin Mary...Are True! Did Our Lady die? Until recently, I would have said no; She was assumed into heaven because of Her purity. I must admit I had not investigated the idea thoroughly, but for a long time, I was under the impression that this meant that she underwent a transition from earth to heaven that was like a sort of Marian Ascension. This impression was reinforced by paintings such as the one below in which She is elevated by angels, while, it appears, very much alive. 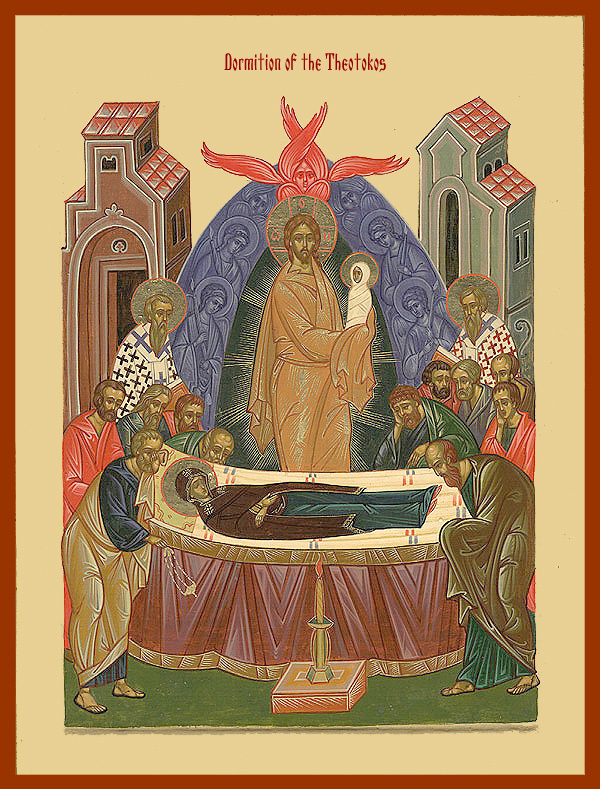 And, furthermore, this special transition through a stage of between earth and heaven has a special name in the Eastern churches, which refers to her “Dormition - falling asleep.” Or so I thought. To my knowledge there is nothing wrong theologically with the painting above, which is by the great Italian baroque artist Guido Reni. (1575-1642) However, it doesn’t tell the full story. 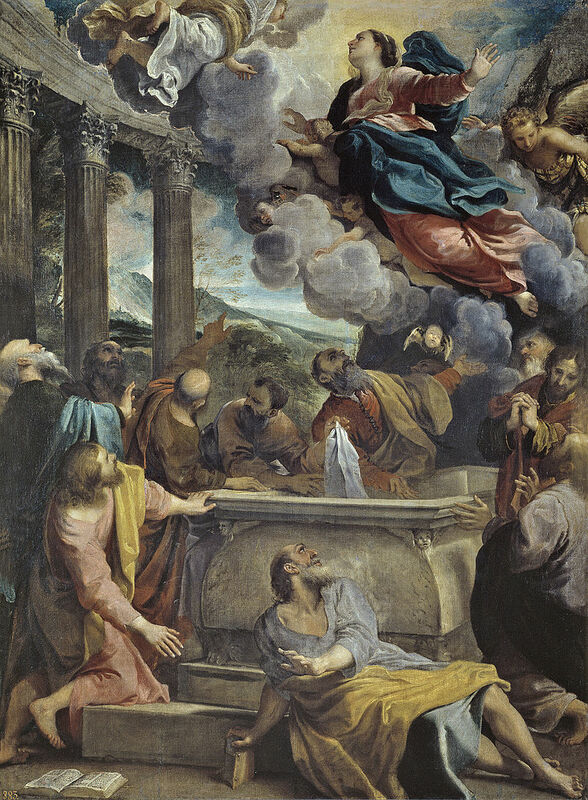 Have a look at this painting of the Assumption by the Italian painter, Annibale Carracci (1560-1609). 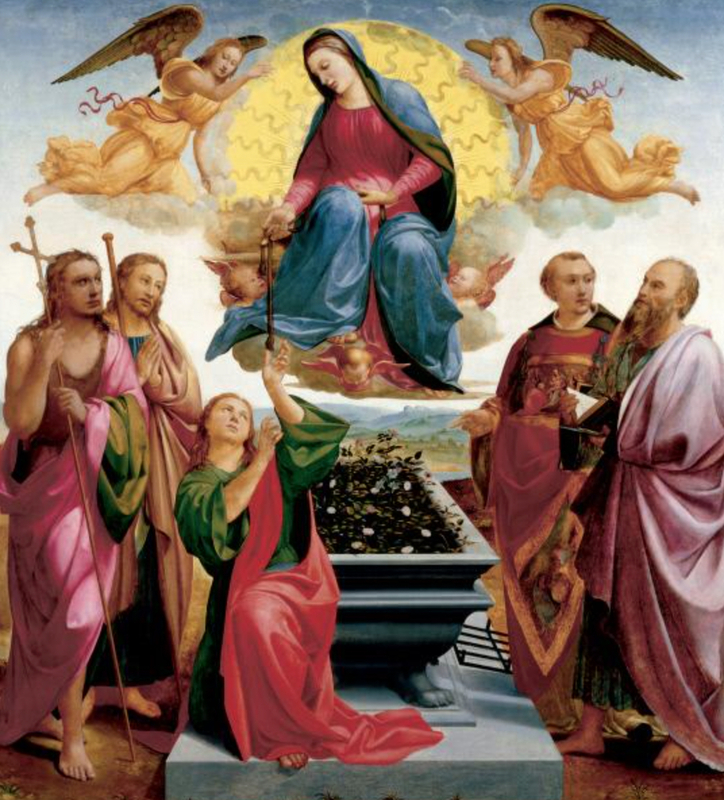 At the top, we have the familiar scene of Our Lady being drawn up to heaven by angels, but at the bottom, we see in addition a group of onlookers who surround a tomb. This scene begs the question, if Our Lady didn’t die, why have a tomb? 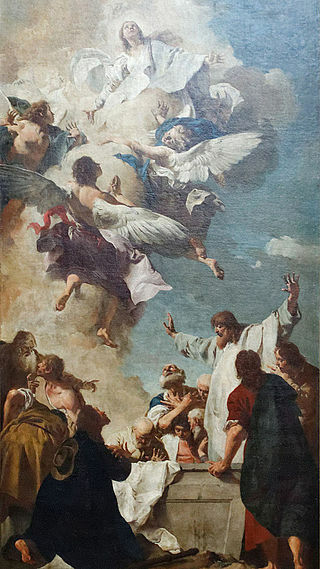 We see the same in the painting below by another Italian, Giovanni Battista Piazetta (1682-1754). Here, not only do we see the tomb, but also there is great shock, revealed by a dramatic gesture, at the fact that the tomb is empty. Clearly, the reason for this is that Our Lady did die at the end of Her earthly life, or at least these artists believed so. In fact, this always been the tradition of the Church, East and West. It can be traced back as far as the fourth century, the period to which is attributed a document called The Account of St John the Theologian of the Dormition of the Mother of God. 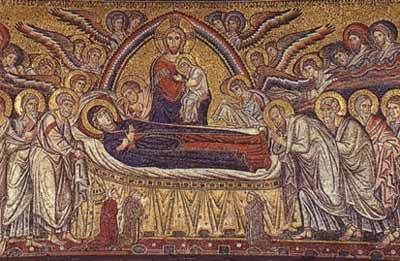 The word “dormition” means literally “falling asleep,” but is used to mean a peaceful death. The tradition says that three days after her death, She was not in Her sarcophagus, which instead was full of fragrant flowers, as we see here in this painting by Francesco Granacci, made in 1515. Below we see two iconographic representations in which the death is more apparent. There is a separation of body and soul, which is received by Christ himself, even before the Assumption. It is represented by the white clad figure he is holding. 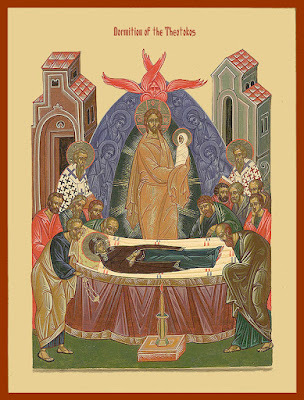 and below: a modern icon of the Eastern Church. So it seems I was wrong in thinking that She didn’t die. Well...probably. While tradition says that Our Lady did die, the dogmatic statement of Pius XII is ambiguous. In the Apostolic Constitution Munificentissimus Deus, published in 1950, he states that her body was incorrupt and was assumed into heaven, but doesn’t explicitly state that She died before the Assumption. So one might argue, I am not bound to believe that she died. However, I am happy to go with tradition and accept that She did die, and am greatly encouraged by this thought. For what Our Lady experienced is bodily resurrection, a participation in the bodily resurrection of Christ, which is offered to all of us. 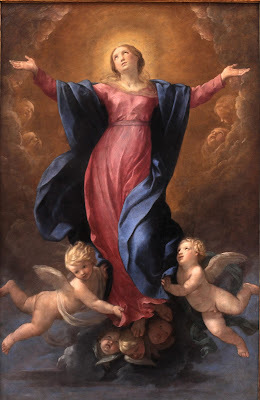 For most of us, unlike Our Lady, there will be bodily corruption beforehand, but ultimately, we have the chance of going to heaven too. This is one of a series of articles written to highlight the great feasts and the saints of the Roman Canon. All are connected to a single opening essay, in which I set out principles by which we might create a canon of art for Roman Rite churches and schema that would guide the placement of such images in a church. Read it here. In these I plan to cover the key elements of images of the saints of the Roman Canon - Eucharistic Prayer I - and the major feasts of the year. I have created the tag Canon of Art for Roman Rite to group these together, should any be interested in seeing these articles as they accumulate. For the fullest presentation of the principles of sacred art for the liturgy, take the Master's of Sacred Arts, www.Pontifex.University.